WBW Solicitors has joined forces with the nation’s heart charity to beat heartbreak forever. The 12-month partnership will see staff at WBW Solicitors raising enough money to fund a month’s research to grow new blood vessels – a vital part of any future therapy to repair damaged hearts, helping find new ways to operate, diagnose and treat heart disease, which costs the charity £5,000. The staff’s decision to support the British Heart Foundation came after they very sadly lost one of their colleagues, Ian Bradbury, who died suddenly in February 2018 due to a heart attack. Having previously had a large heart operation 10 years prior, the staff at WBW felt the best way to honour Ian’s legacy was to help fundraise to assist others in the future. Jessica Rimmer, Marketing Manager, said “Ian Bradbury had raised a huge amount of money for our 2017 charity, Brain Tumour Research. 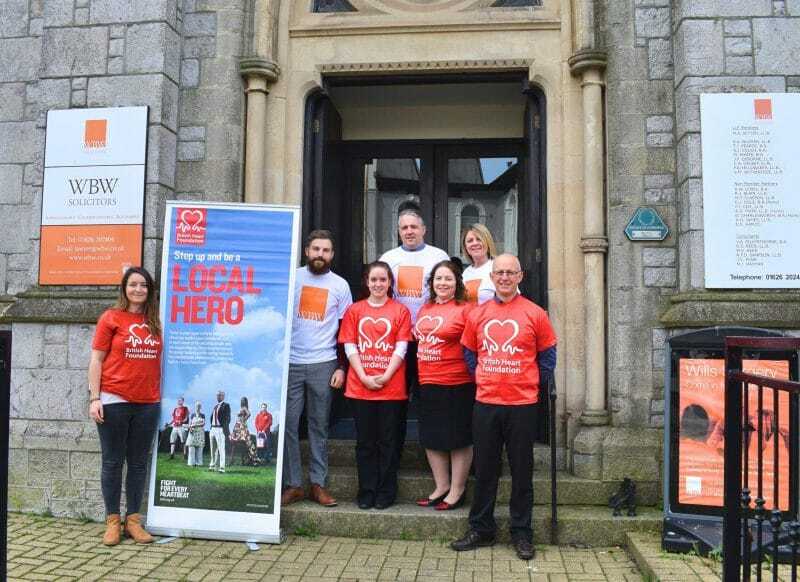 Everyone at WBW Solicitors was shocked and saddened by the sudden loss of such an esteemed colleague, so we felt it would be very fitting to raise money for The British Heart Foundation in memory of Ian this year”. The partnership will see staff across the company raising funds individually and as a team, through various fundraising activities throughout the year. The two organisations launched their partnership, commencing in May, with a planning meeting and a rather windy photo of some of the staff outside the WBW offices in Newton Abbot. Joy Petley, Fundraising Manager, said “It is fantastic to have WBW Solicitors supporting the British Heart Foundation this year. I was saddened to hear of their news and reasons behind choosing us as their next partner. I hope we can highlight healthy living throughout our partnership, and raise funds to really impact some of the research that is taking place here in the South West”. Over the last year, sadly 5,109 people died from Cardiovascular disease in Devon and Cornwall alone. The British Heart Foundation has distributed 586 CPR Kits and helped fund nearly 2000 defibrillators across the South West to help save lives. The team are planning to visit the British Heart Foundations research laboratory in Exeter to see first-hand the impact of funds raised by the community and learn more about the pioneering research that is taking place in the county’s capital. Heart and circulatory disease affects around 7million people in the UK and is responsible for around 155,000 deaths each year. The BHF is the leading independent funder of heart research and is committed to funding £500m of new research over the next five years to help revolutionise the prevention and treatment of heart conditions. There are currently 135 research projects taking place in the South West to help fight disease.